same day relocation of equipment between sites. Our warehouses in Doncaster and Kent provide easy access to Europe as well as northern England and Scotland. 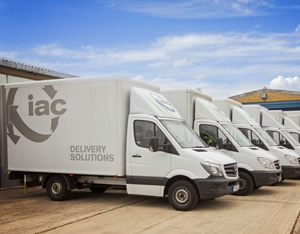 Uniquely, IAC Delivery Solutions have both Goods in Transit insurance (up to £15,000 per vehicle) and £2 million Public Liability insurance. This means your equipment is completely insured from the time it leaves our warehouse to the time it arrives on site and is positioned safely at its final location. Each job is individually priced and our competitive charges take into account the weight of goods, time taken, mileage covered and skill required. As a result you always get exactly the service you need, and won’t pay for extras you don’t.